Reliable estimates of heavy-truck volumes are important in a number of transportation applications. Estimates of truck volumes are necessary for pavement design and pavement management. Truck volumes are important in traffic safety. 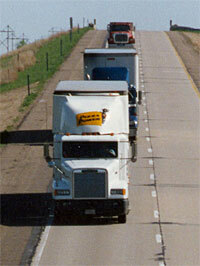 The number of trucks on the road also influences roadway capacity and traffic operations. Additionally, heavy vehicles pollute at higher rates than passenger vehicles. Consequently, reliable estimates of heavy-truck vehicle miles traveled (VMT) are important in creating accurate inventories of on-road emissions. This research evaluated three different methods to calculate heavy-truck annual average daily traffic (AADT) which can subsequently be used to estimate vehicle miles traveled (VMT). Traffic data from continuous count stations provided by the Iowa DOT were used to estimate AADT for two different truck groups (single-unit and multi-unit) using the three methods. The first method developed monthly and daily expansion factors for each truck group. The second and third methods created general expansion factors for all vehicles. Accuracy of the three methods was compared using n-fold cross-validation. In n-fold cross-validation, data are split into n partitions, and data from the nth partition are used to validate the remaining data. A comparison of the accuracy of the three methods was made using the estimates of prediction error obtained from cross-validation. The prediction error was determined by averaging the squared error between the estimated AADT and the actual AADT. Overall, the prediction error was the lowest for the method that developed expansion factors separately for the different truck groups for both single- and multi-unit trucks. This indicates that use of expansion factors specific to heavy trucks results in better estimates of AADT, and, subsequently, VMT, than using aggregate expansion factors and applying a percentage of trucks. Monthly, daily, and weekly traffic patterns were also evaluated. Significant variation exists in the temporal and seasonal patterns of heavy trucks as compared to passenger vehicles. This suggests that the use of aggregate expansion factors fails to adequately describe truck travel patterns. The number of heavy vehicles on a road affects traffic operations, safety, and pavement performance.